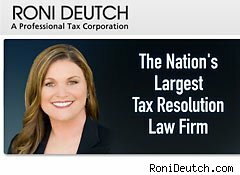 Nearly eight months after the state of California hit her with a $34 million lawsuit alleging that she defrauded thousands of consumers who sought her tax advice, Roni Deutch, the so-called "Tax Lady," has landed back in court. This time, according to the Sacramento Bee, Deutch's assets have been frozen; Deutch also faces potential jail time on charges of contempt of court. In August 2010, the sitting California Attorney General (now Governor) Jerry Brown filed suit against Deutch, accusing her of airing misleading advertisements about her services and engaging in heavy-handed sales techniques to pressure potential clients. Included in the allegations were charges that Deutch's firm not only did not provide the services promised to clients but that she refused to refund fees. The Attorney General revealed that, as of April 5, 2011, Deutch had allegedly admitted that her firm had outstanding refund requests that had been on the books for more than 60 days, and which totaled more than $435,000.An additional order was issued in August prohibiting Deutch from destroying any evidence related to the case. According to the current attorney general of California, Kamala D. Harris, however, Deutch began shredding documents immediately. The attorney general's office alleges in its complaint that Deutch shredded nearly 2,000 pounds of the firm's documents, or about 200,000 pages the day after the order was issued. Harris estimates that to date, Deutch has shredded at least 1.5 million-plus pages of documents -- and potentially many more. Three months after the initial charges were filed, Deutch was advised that she should no longer take fees from potential clients while her current case load was being reviewed due to a number of client complaints. That same month, Deutch allegedly ignored a preliminary injunction requiring her to return unearned fees to clients within 60 days. Instead, according to the attorney general, Deutch "decided to disperse funds to friends, family and other creditors. By draining her estate and that of the law firm, Deutch has placed her clients at serious risk of never receiving their refunds." At least part of the order has been granted. Judge Shelleyanne W.L. Chang of the California Superior Court has frozen Deutch's assets and appointed a receiver, Scott M. Sacket, to monitor Deutch's financials. In addition, a court date of July 2011 has been set on the contempt charges, and the attorney general has asked for the maximum penalty allowable. If Deutch is found in contempt, she faces up to five days in prison and $1,000 in fees for every count of the more than one hundred contempt charges alleged by the State of California.